This is a course for high school students. 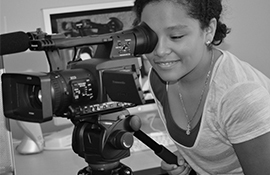 From setting up a camera to shooting, editing, and uploading content, students learn all aspects of video production. They put their skills to use by serving as the crew for many of our live-streamed and recorded events. Endorsed by the Virginia Department of Education, this semester course is eligible for a .5 independent study credit for high school students. When you take part in the creation of a story, it becomes real for you. This is how ELLA (Early Literacy Learning through the Arts) enriches the learning experience for our region’s Pre-K students. Learn more about our partnership with Wolf Trap. Through a variety of school-day and after-school settings, teaching artists work with teachers to apply the arts to teaching in all areas of the curriculum, including the performing arts. RPAA can recommend teaching artists for grant programs or also tailor an artist residency experience to meet your school’s needs. For more information contact Education Assistant Melissa Rayford at mrayford@rpaalliance.com or (804) 592-3381. In conjunction with performances at RPAA venues, performance-based learning events include our Wells Fargo OnStage School Series and Bardathon — an annual collaboration with Quill Theatre that brings high school theater teams together to perform a classic work of the Bard. We also live-stream Cast Chat-Backs featuring actors from the touring Broadway in Richmond series and master classes and lecture-demonstrations with other touring artists. To receive information on upcoming opportunities, please contact Education Assistant Melissa Rayford at mrayford@rpaalliance.com or (804) 592-3381. For eight years now, RPAA has partnered with Quill Theatre to present Bardathon, the region’s only non-competitive theater festival program. Sponsored by the Richmond Chapter of the English Speaking Union, Bardathon brings high school theater teams from across the region together, to Dominion Energy Center, to perform a work of the Bard. Teams are assigned scenes from the year’s chosen work. They then rehearse for months at their (respective) schools, putting their own interpretation of scene (small props), costume and other aesthetic choices to their performance. Finally, the teams ascend on the Libby S. Gottwald Playhouse to perform the piece in its entirety. The performance is live-streamed for parents and peers to watch, including a team from St. Petersburg, Russia who have participated in the program for six years running. Richmond Performing Arts Alliance (RPAA) provides professional development for teachers and Teaching Artists that introduces new strategies for teaching in the arts, as well as applying the arts across the curriculum.